I've always loved the idea of homemade gift coupons/vouchers. In a world of mass produced presents and plastic gift cards, they're a truly thoughtful way to treat your friends or family to "labors of love" by offering your services. I remember making them with crayons and construction paper as a kid, and giving them to my mom with promises of extra help with household chores and special tea parties. As an adult, I've made them for my husband for Valentine's Day ("good for 1 breakfast in bed," "good for 1 backrub"), and for friends for their birthdays ("good for 1 lunch date," "good for 1 babysitting session"). 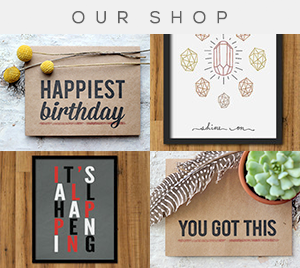 They're a creative and budget-friendly way to give unique gifts to your significant other, parents, kids, co-workers or friends for almost any occasion. And the meaningful gesture behind them won't fade as soon as the occasion is over. Handmade gift coupons by themselves can be wonderful, but they can be a bit bland visually. Sometimes I think my favorite part of giving presents is the process of finding ways to creatively wrap and decorate them to make them more customized and unique. The same concept can be applied to spruce up gift vouchers. While brainstorming recently, I came up with the idea to incorporate photos. This not only makes the coupons much more personalized, it also makes them much more aesthetically pleasing. 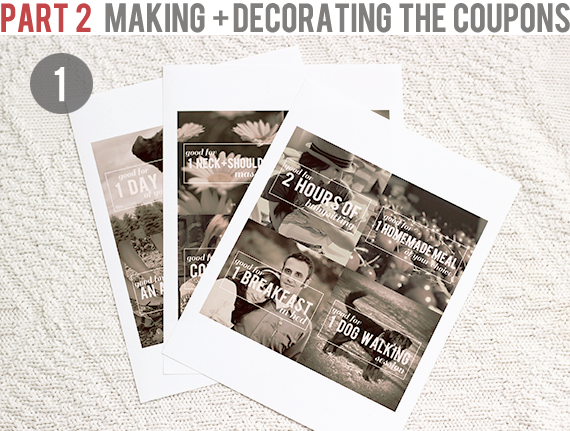 By making a few quick edits and adding text in Photoshop Elements, printing and cutting your finished photos, and adding some simple embellishments, you can create really beautiful, memorable gifts for your friends and family. This is a two part project, but don't let the "two parts" scare you. It's easy and only takes about an hour to create a set of 12 gift coupons. You can also reduce it to 4 or 6 coupons if you're really short on time or just want to whip up a small gift. 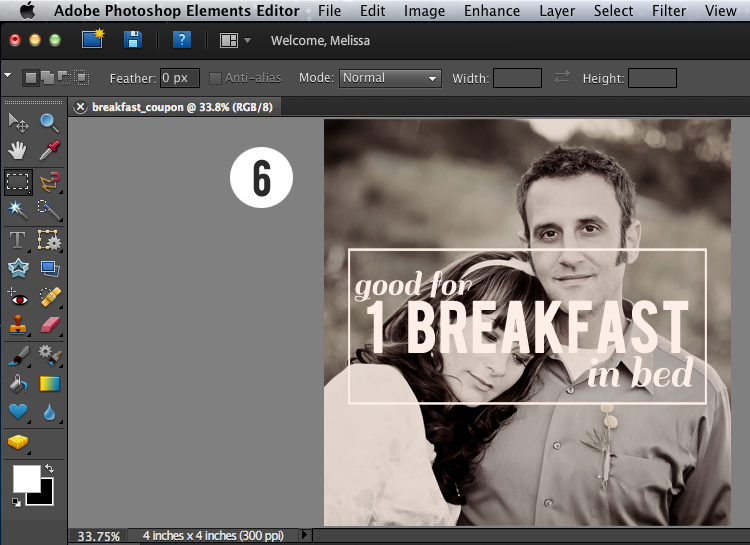 For Part 1 of the tutorial, we'll use Photoshop Elements to edit your photos and add text. For Part 2, we'll assemble and decorate the coupons, then put them together into a finished set. *For larger views of any of these screenshots, click on the images. 1. Decide on 12 photos. Open the first photo in Photoshop Elements (File > Open). Start off by opening and editing one photo. 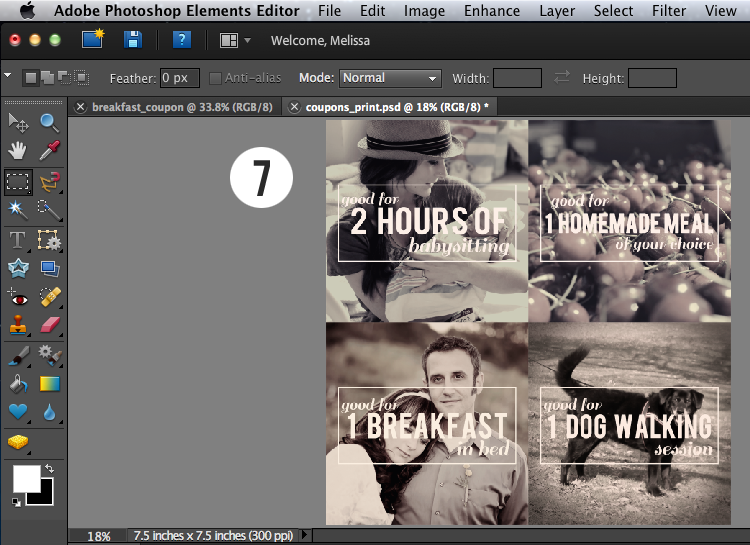 You're going to save the initial image as a template, so once the first image is edited, the rest will go by quickly. TIP: When choosing which photos to use, try including a mixture of significant shots (you and the recipient together, memories you share, your favorite photos that you've taken yourself, etc.). You're also going to want to opt for high resolution images (300 DPI or higher), since you'll be printing them. 2. Resize your photo to a 3.75 inch square. 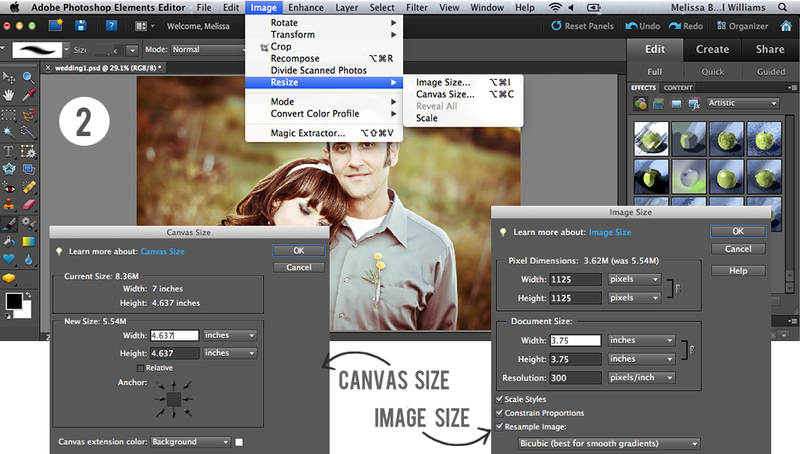 First, use Canvas Size (Image > Resize > Canvas Size) to make the image a square. The Canvas Size dialog box will pop up. If it's landscape, reduce the width size to match the height. If it's portrait, reduce the height to match the width. Click OK > Proceed. Next, use Image Size (Image > Resize > Image Size) to resize to 3.75 inches. The Image Size dialog box will pop up. Make sure all three check boxes in the bottom right (Scale Styles, Constrain Proportions, Resample Image) are checked. Change the width to 3.75 inches (the height will automatically change). Click OK.
3. 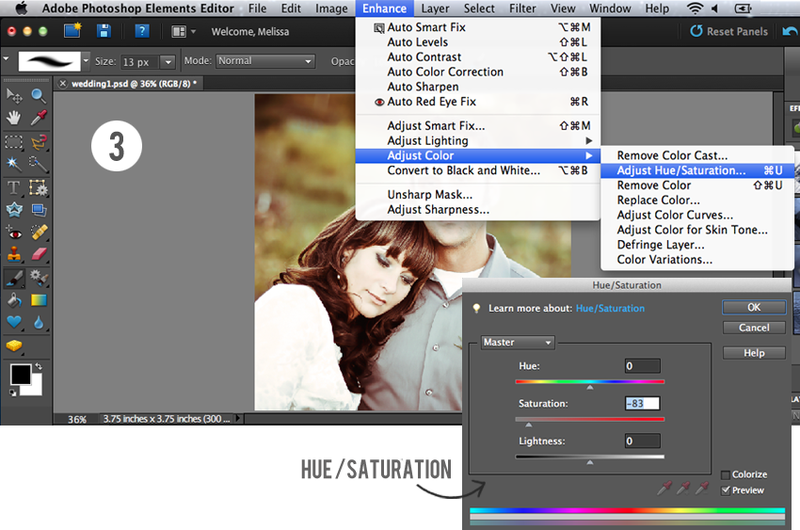 Reduce color saturation (Enhance > Adjust Color > Adjust Hue/Saturation). In order to make the pale text we'll be adding later pop and all 12 of your photos uniform, we're going to reduce the color saturation. The Hue/Saturation dialog box will pop up. Move the Saturation slider to the left until you're satisfied with the amount. We don't want to desaturate completely so the image is black and white, but we want to reduce the color quite a bit. Click OK. TIP: After this step, feel free to play with your Levels (Enhance > Adjust Lighting > Levels) to lighten or darken your image. Again, you want the white text that we'll be adding to pop. 4. Add text. Decide what you'd like your coupon to say, then decide on two contrasting fonts. To do this, select the Text Tool from the Toolbox Menu (A) on the left side of the screen, choose white or cream for the Foreground Color (B), choose your first font from the Font Menu (C) on the top left, choose a Font Size (D), type your text on top of the image, and use the Move Tool (E) to position the text. Then repeat this for the second font. 5. 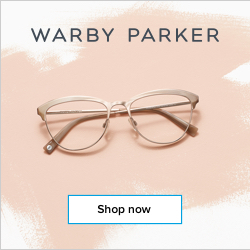 Add a border around the text. There are many different ways to do this, but this is the method that I prefer. First create a new layer (Layer > New > Layer > OK). Then select the Rectangular Marquee Tool from the Toolbox Menu, use your mouse to draw a rectangle around your text, and fill with white (Edit > Fill Selection). The Fill Layer dialog box will pop up. 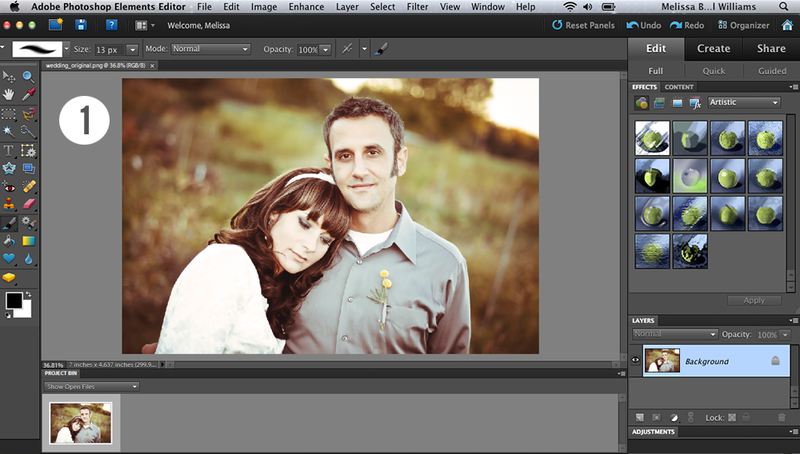 Make sure Foreground Color is selected under Contents, and Normal Mode and 100% Opacity are selected under Blending. Click OK. Then contract the selection (Select > Modify > Contract). The Contract Selection dialog box will pop up. Choose 5 pixels, then click OK. Finally, click the Delete key on your keyboard. 6. Save this image as your template, then repeat these steps with your other photos. (File > Save As). Make sure you first save this image as a Photoshop file to retain the layers. Name it something like 'Template.psd'. 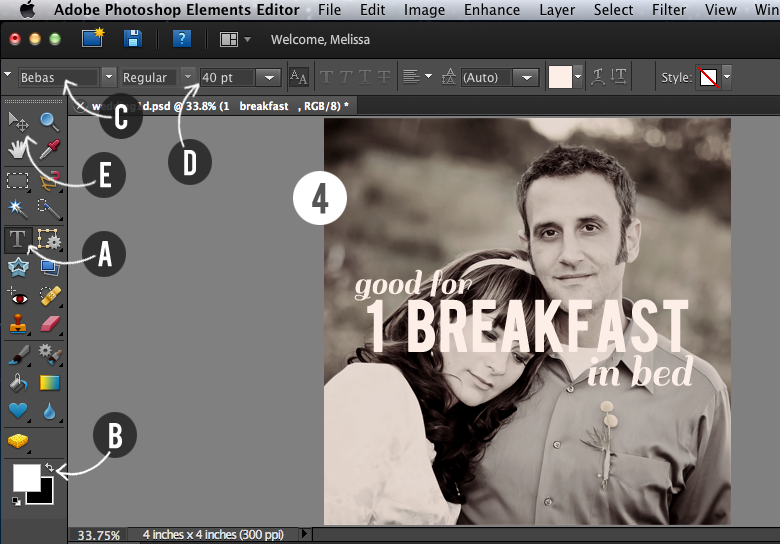 Then flatten it (Layer > Flatten Image) and save it again (File > Save As), this time as a .jpg or .png under a different name (I named this one breakfast_coupon.png). 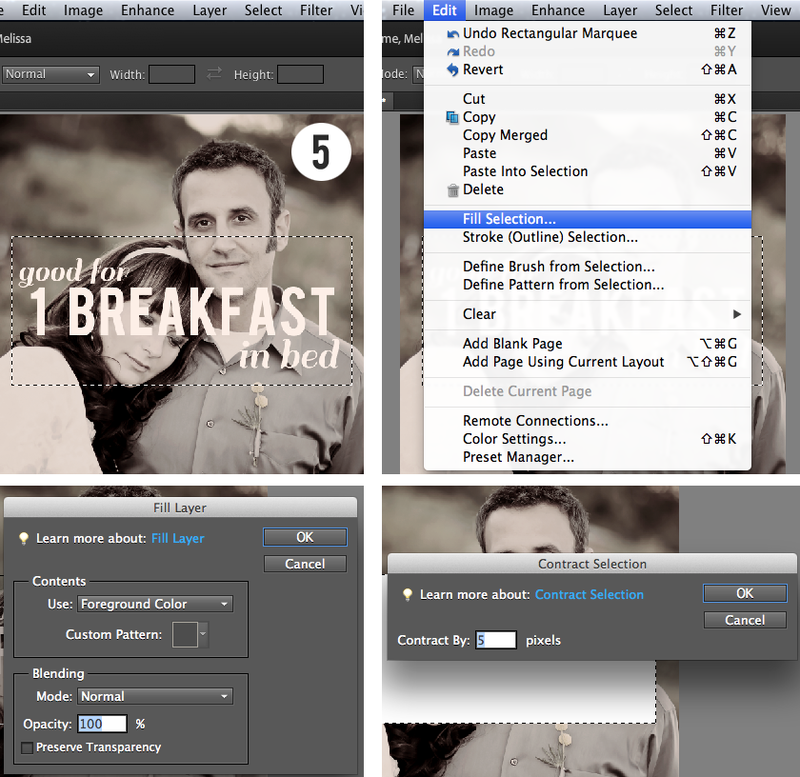 TIP: To save time when editing the rest of your photos, first reopen the unflattened image that you named 'Template.psd.' As you edit each photo, after step 3 above, you can copy and paste (Command A > Command C > Command V on a Mac or Ctrl A > Ctrl C > Ctrl V on a PC) onto this template under the text and border layers. That way you'll just have to change what the text says for each coupon and won't need to repeat steps 4 and 5. 7. Create finished files for printing. (File > New > Blank File). The New dialog box will pop up. Because you will be printing four of the 3.75 x 3.75 inch edited photos on each sheet of your 8.5 x 11 matte photo paper, set this new file to a width of 7.5 inches and a height of 7.5 inches. 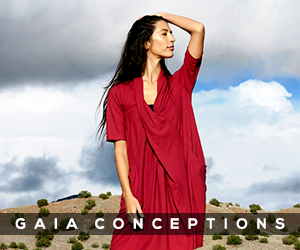 Make sure that it is the same resolution (300 pixels/inch) as your photos. Repeat this three times to create three new files. Then copy and paste four of your edited photos onto each of these three files. Use the Move Tool to position them as shown in the screen shot above. Flatten each file (Layer > Flatten Image), and Save (File > Save As). You are now ready to move on to Part 2! 1. Print photos. 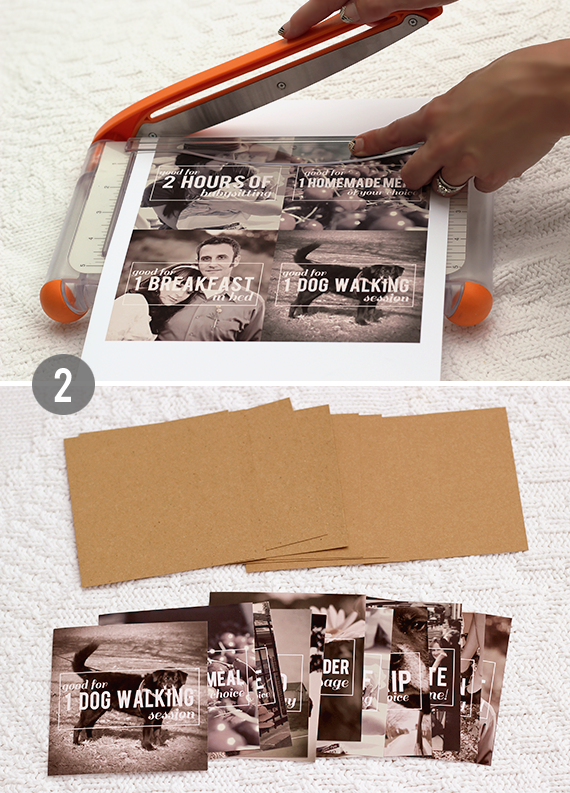 Print each of your 3 sheets of completed photos on matte photo paper. In your printer's setting, make sure to choose the proper paper type and "high" or "best" for the quality. 2. 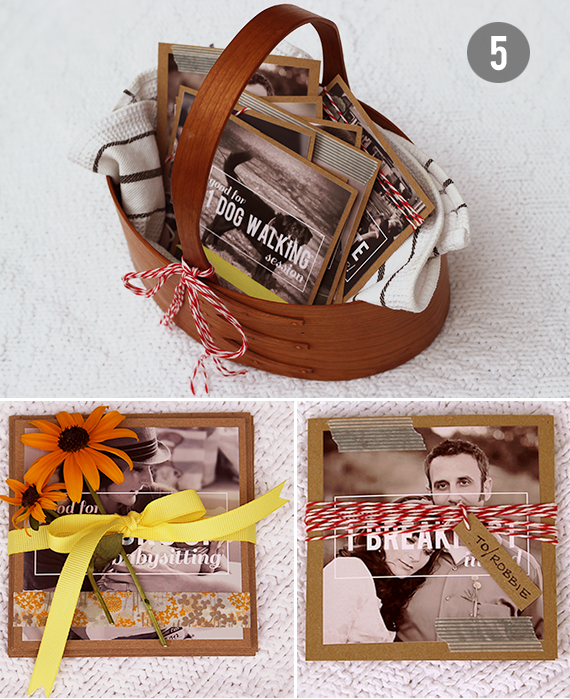 Cut your photo and cardstock squares. 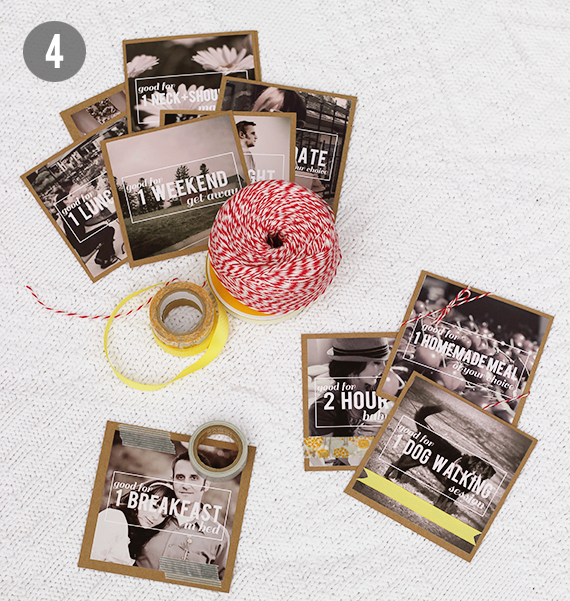 Use a paper cutter or scissors to cut your photos into 3.75 x 3.75 inch squares, and your cardstock into 4 x 4 inch squares. You can use any color cardstock you'd like. I chose kraft because I think it gives a nice, rustic contrast to the desaturated photos. 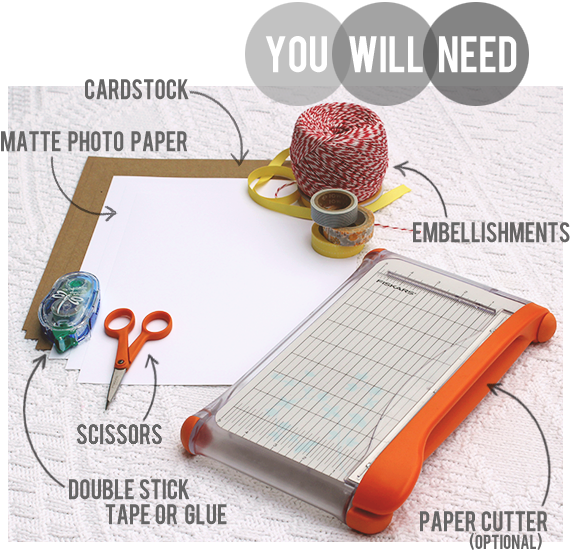 TIP: Although a paper cutter will make your cutting easier, it's not necessary if you don't already have one. Just use a ruler to measure out one 4 x 4 inch square on your cardstock, then use it as a template to cut out the 11 cardstock squares with your scissors. 3. 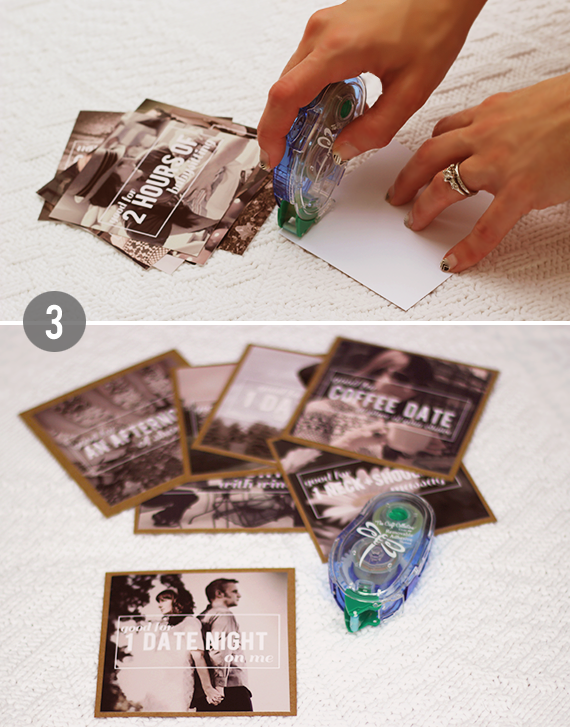 Attach photos to cardstock. Apply double-sided tape or crafting glue to the back of one photo, then center and firmly press onto one cardstock square to attach. Repeat this for all 12 photos and cardstock squares. 4. Decorate your coupons. Now comes the really fun part: using different embellishments to decorate! This makes each individual coupon unique, and creates a nice aesthetic that allows the coupons to transform into truly thoughtful, handmade gifts that are also mini works of art. I used patterned washi tape, yellow ribbon, and red and white bakers twine, which were all items that I already had around the house. There are no rules for how to decorate your coupons. Use your imagination and things that you already have lying around (gift wrapping supplies, stickers, pieces from stationary sets, ribbon, etc.). 5. Create your finished set. The last step involves creatively assembling your coupons into a nice finished set. One suggestion is to display them in a basket with some fabric or tissue paper, and make a simple bow out of the same ribbon or twine that you used to decorate your coupons. (In the top image, I used vintage tea towels and red and white bakers twine.) If you'd like to keep things a little simpler, you can use ribbon or twine to tie your coupons together into a set, then add a couple of small flowers or make a mini gift tag from your cardstock and attach with some twine. You could also use cardboard jewelry boxes, tins, or envelopes to hold your coupons. Or try punching holes in the top left corners of your coupons, then attach them together with a piece of ribbon to create a coupon book. The possibilities for presentation are endless, so feel free to be as creative as you want! 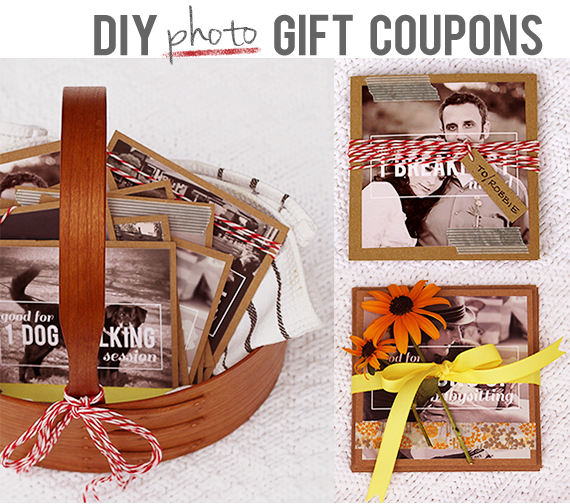 Lastly, give away your handmade photo gift coupon set, and watch the recipient instantly smile. Seriously. They're going to love it, I promise. I hope you guys liked this DIY project and that you try it out the next time you need a fun + unique gift idea for a friend or loved one! The tutorial was put together as part of my series partnering with Adobe as a Photoshop Elements ambassador. You can also view my tutorial for creating double exposure effects in your photos here, and my tutorial for giving your photos a dreamy, summertime inspired look here. 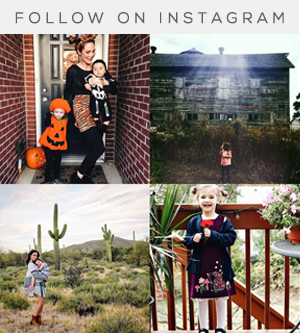 In addition to here on the blog, you can follow my Photoshop Elements Ambassador adventures throughout the summer via my Twitter and Instagram (@bubbyandbean) accounts. You can also keep up to date with the project and other Photoshop Elements goodness by visiting Adobe Photoshop Element's Twitter, Facebook, Pinterest, and YouTube accounts. This is so darling, Melissa! I love this! I've been tossing around an idea like this for Christmas this year (yeah, I'm that person who thinks about Christmas in July). OMG you clever girl!!! I LOVE this! This is AWESOME! i love the way you edit your photos!!! Do you purchase actions?? Thanks Jenny! I don't have any purchased actions, although I do make my own sometimes. For this project though, all of the steps on how to edit them are outlined above :). Wow, this is amazing. Both my husband and I have done the coupon thing, but I never thought to make it so cute! Love this DIY! Much better than the traditional homemade coupons. :) May I ask what printer you have and if you would recommend it? 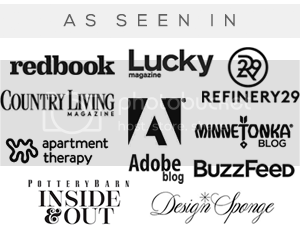 I am looking for something that does well with photos but is great with other print jobs as well. Hi Ash, I have a Canon PIXMA and use Canon ChromaLife inks. There are a lot of different levels within the PIXMA series of their printers depending on your needs. I highly recommend them! Awesome DIY! I love this idea and it's so cute! This is just the most adorable thing. These are the chicest gift vouchers I've ever seen. Thanks for the "how-to!" Thank you so much for this tutorial! I just made these for my hubby for our 2nd anniversary and he LOVED them. They are so cool and chic-looking... not cheesy at all. Thank you! !